Are you confused when marketers start talking about PHP, FTP, PPC, and a zillion other terms you’ve never heard of? This dictionary is for you. 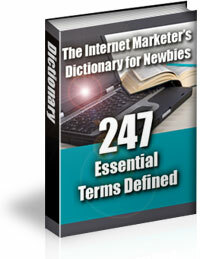 I’ve covered 247 of the most commonly used words and phrases in the online marketing world. If you’re planning on starting your own online business, you need to learn the lingo! If you want to quickly cut down your learning curve and rise above the confusion, I recommend downloading this ebook today! It is a 70-page PDF file, and you can download it immediately. Regular Price $47 Only $7 Today!